Preheat oven to 160ºC (325ºF). Line 2 x lightly greased 20cm round cake tins with non-stick baking paper and set aside. Place the butter, maple syrup, both sugars and vanilla in the bowl of an electric mixer and beat for 8–10 minutes or until light and creamy. Scrape down the sides of the bowl and add the eggs, one at a time, beating well after each addition. Transfer the mixture to a large bowl and fold through the flour, baking powder and milk until combined. Divide the mixture between the prepared tins and bake for 1 hour 20 minutes or until cooked when tested with a skewer. Allow to cool in the tins for 10 minutes before turning out onto wire racks to cool completely. To make the icing, place the sugar and water in a medium saucepan over high heat and stir until just combined. Bring to the boil and cook for 13–15 minutes, without stirring, or until golden and the temperature reaches 172ºC (341ºF) on a sugar thermometer. Gently swirl the pan once the sides start to caramelise. Remove from the heat and carefully add the cream in a thin, steady stream. Stir to combine, return to low heat and stir for 30 seconds – 1 minute or until well combined. Pour into a bowl and allow to cool completely. Place the butter in the bowl of an electric mixer and beat for 6–8 minutes or until pale and creamy. Scrape down the sides of the bowl, add the cooled caramel and beat for a further 6–8 minutes or until well combined. To assemble, trim the tops of the cakes and halve each cake horizontally. Place the bottom layer on a cake stand or serving plate. Use a palette knife to spread ½ cup of the icing onto the cake. Top with another cake layer and repeat with the icing and remaining layers. Spread the top and sides of the cake with the remaining icing, taking care to create a smooth finish. Refrigerate the cake for 3–4 hours or until the icing is firm and cold. Place the chocolate and oil in a heatproof bowl over a saucepan of simmering water and heat until melted and smooth. Remove from the heat and allow to stand at room temperature until completely cool, but still runny. Pour the chocolate onto the cooled cake and spread evenly over the top, gently pushing some of the chocolate over the edge to create a drippy effect. Refrigerate for 1 hour or until the chocolate is set. Allow the cake to stand at room temperature for 30–45 minutes before serving. Serves 12–14. Tips: The cake and icing can be made 1 day ahead. Wrap the cakes in plastic wrap and place the icing in an airtight container in the fridge. Bring the icing to room temperature and beat to soften before assembling. Hi Shiralee, we haven’t tested this so we can’t guarantee how it will turn out. Let us know how you go! The DH Team. Hi, Just wondering if this cake would be suitable for a swiss roll cake? Thanks for responding. I did 2 batches of this frosting, 1 that was the DH version and 1 with the added icing sugar. I must admit the DH was nicer! Not too sweet and it was so smooth and so delicious!! Hi Donna Hay, I’ve made the cake now onto the icing. Can it be made with icing sugar and some salt to the butter so it’s thick enough to pipe swirls on top? Is there a reason why there’s no icing sugar? I just want to know what the consistency is like without the icing sugar in this butter cream? I made this cake last week. It was delicious, however I found the icing very tasteless (very smooth though). Are there any recommendations to give it a bit of (perhaps caramel) taste! Thank you! Hi there, I’m also interested in making this cake ahead of time. 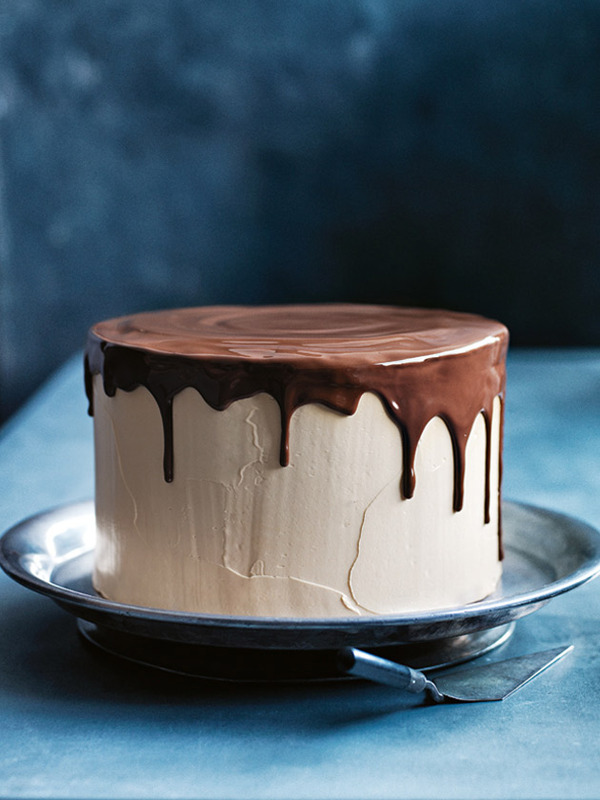 What is the best way to defrost the cake before icing? Thank you!